You don’t need to be a size queen to think big is better. The terribly named “phablet” category is where the lines between smartphones and tablets blur. Screens whose size we might have chuckled at a few years back are excellent for productivity apps and gaming, media playback and reading, and with the launch of the iPhone XS Max we have a new rival to the Galaxy Note 9’s throne. But, how do they compare? 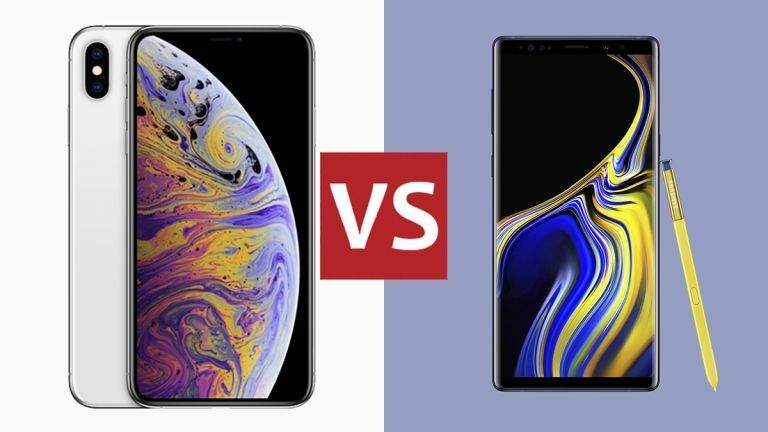 Here we pit the super-sized Apple iPhone XS Max versus the mighty Samsung Galaxy Note 9. The iPhone XS Max doesn’t look dramatically different from the iPhone X, but it’s significantly bigger: the OLED panel has grown from 5.8 inches to 6.5 inches. It retains the proportions and design of its smaller predecessor, with stereo speakers but no headphone jack. It’s IP68 certified for water and dust resistance. The Galaxy Note 9 is comparatively bulky looking. Its display is a little smaller at 6.4 inches but it somehow manages to look bigger than the iPhone. It’s IP68 with a proper headphone jack, and doesn’t have the notch that’s proved divisive among Apple fans and commentators. Previous Note users will welcome the repositioned fingerprint sensor, which now lives below rather than next to the camera. The iPhone XS Max doesn’t support Apple Pencil, but of course the Note has the obligatory - and revised - S Pen, which also works as a remote control for your camera, presentations and apps over Bluetooth. The iPhone XS Max has an OLED screen delivering 2,436 x 1,125 pixels with True Tone colour, million-to-one contrast ratios and Dolby Vision HDR 10. It’s good, but the Samsung is better. The Galaxy Note 9’s Super AMOLED “Infinity Display” display is exceptional. It delivers 2,960 x 1,440 pixels and again, it’s HDR 10 compliant. It’s not as lurid as previous Super AMOLEDs - some reviewers say it’s a little too reserved by comparison - but it’s crisp, clear and vivid. It’s brighter than the Apple display and has a much wider colour gamut. Apple’s Bionic A12 processor is significantly faster and less power hungry than before, with Apple claiming a 15% performance boost and 40% lower power drain in the performance cores and 50% less power drain in the energy efficient cores. The GPU runs 50% faster than the one in the A11, and its neural engine now has eight cores, not two. Apps launch a claimed 30% faster, and the Core ML machine learning framework runs nine times more quickly. The iPhone XS Max doesn’t support external storage but is available with 64, 256 or 512GB of internal storage. There’s 4GB of on-board RAM. The Samsung Galaxy Note 9 comes in two flavours. In the US and China it’s powered by an octa-core Qualcomm 845 with an Adreno 630 GPU, while in the rest of the world it’s an octa-core Exynos 9810 with a Mali G72 GPU. There’s 6GB of RAM on the 128GB model, or 8GB if you go for the 512GB version, and you can add up to 512GB of storage on the dual-SIM model. As ever, spec sheets don’t tell the whole story. When Tom’s Guide benchmarked the Galaxy Note 9 against the now-retired iPhone X, the Apple device left the Note in the dust with a 10,357 Geekbench score compared to the Note 9’s 8,876. The iPhone XS Max is faster. The iPhone XS Max’s A12 Bionic processor enables the familiar 12MP dual-lens setup to deliver better photos than the iPhone X. It delivers improved face and body detection and scene analysis, as well as better portrait shooting. In the most eye-catching feature it enables you to change depth of field after you’ve taken your shot, so for example you can move from f/1.4 to f/16 with a swipe to bring the background in or out of focus. Smart HDR uses a four-frame buffer to capture the right shot with what feels like zero shutter lag; it also takes simultaneous higher and longer exposure shots to capture highlights and shadows. Those multiple shots are then automatically combined into a single image. The Galaxy Note 9 has a 12MP “Super Speed Dual Pixel” dual-lens setup capable of f/1.5 for great low light shooting. It also has a clever noise reduction algorithm that combines multiple photos to identify and remove unwanted image noise and claims that it’s almost impossible to take a bad picture thanks to its artificial intelligence. It also shoots 4K at up to 60fps, 1080p at up to 240fps and a super-slow motion mode that delivers a whopping 960fps at 720p. Apple claims that the iPhone XS Max lasts for an hour and a half longer than the iPhone X, which has a 2,716mAh battery. The Max’s battery appears to be a hefty 3,400mAh, which more than compensates for the larger display. It supports wireless charging and USB via its lightning port. The Samsung battery is bigger still: it has a 4,000mAh battery with fast wireless charging and USB-C. The iPhone XS Max runs iOS 12, which isn’t dramatically different from iOS 11: notifications, parental controls and battery management are all improved, there’s a new augmented reality measuring app that people are already using to measure their pets and the rebranded Workflow app – now Shortcuts – might just make Siri interesting again. But most of the changes are under the hood with a focus on efficient performance. The Note S9 software is Android Oreo (8.1) with Samsung’s own Samsung Experience tweaks and the Bixby personal digital assistant, which delivers live translation, food calorie information and information about the places near you. But the main difference software-wise is in the integration of the S Pen, which is now a clicker and shutter button as well as a stylus. You can customise what its button does and use it in screen-off mode to scribble quick notes without unlocking your phone, and the Samsung Notes application makes good use of its many talents. You picked your platform years ago, we know, so it doesn’t really matter whether the iPhone XS Max massively outperforms the Samsung (it does) or if the S Pen adds a whole level of functionality the iPhone can’t match (it does). But if you’re that rare thing, someone who’s so far sat out the iOS vs Android wars, the two devices represent two very different approaches: the Note wears a suit and tie, spends a lot of time in airports and charges from big important meeting to big important meeting, while the iPhone is hanging around coffee shops doodling ideas for its next album cover. The contrast between those images and the actual pricing is quite stark, though: at £1,099 for the basic 64GB model and a whopping £1,449 for 512GB the iPhone XS Max is the most expensive iPhone ever. At £899 for 128GB and £1,099 for 512GB the Samsung is an awful lot cheaper. In terms of performance the iPhone is clearly the better phone, but the Samsung may well be the better buy.